← What is the Difference Between a Loyalty Scheme and a Loyalty Program? Mobile is a growing industry. The amount of hype it has acquired over the past couple of years has not disappointed the results we have been receiving. Have a look at these stats from Mashable, which prove that mobile is not finished evolving and developing and has room for growth. 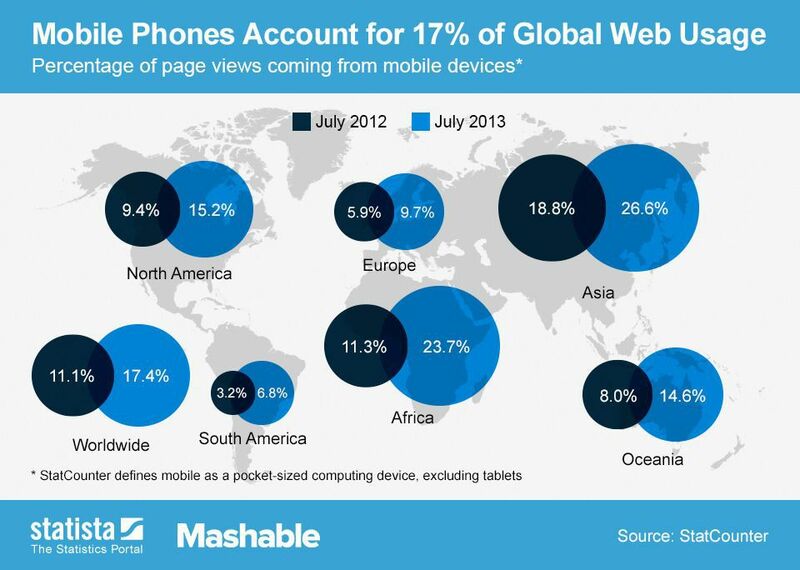 Statista‘s chart below shows the increase in mobile web traffic over the last year, broken down by continent. Mobile web traffic more than doubled in South America, the continent with the largest growth rate, where web access via mobile leaped from 3.2% to 6.8%. Asia and Africa lead the planet as the two continents with the most-mobile web users, with 26.6% and 23.7%, respectively, of web traffic coming from mobile devices. Are you a par of the 17.4%? I am. Leave a comment of your thoughts. This entry was posted in App Development, Mobile Advertising, Mobile Marketing, Smartphones, Technology and tagged growth, mobile, mobile sites, smartphones, web, web traffic. Bookmark the permalink.